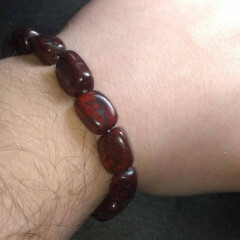 A gorgeous multi coloured form of Jasper – typically multi coloured, with a rich earthy red colour as the base. This is an interesting form of Jasper, usually a base red colour due to Iron Oxide inclusions. The stone typically has many other colours running through it, and may even have clear Quartz crystal inclusions. 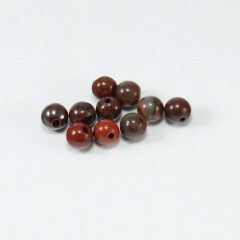 It is quite rare to find any Jasper with a single colour – they are typically banded, spotted, or at least multi coloured. It is typically sold polished, as a shine is the best way to show off the stone – it may be cut into cabochons or beads for cheaper jewellery, or it may be carved into decorative items. Jasper is found around the world – Australia, the USA, India, Canada, Russia, and many more locations – although Brecciated Jasper may not be found in all of these locations. The name comes from the word Breccia, which refers to old broken rocks and stones which have melded together, usually in a matrix made of cement, sand, silt, or clay. This stone is considered a nurturing stone – and is meant to help you to put the pieces together – a fractured memory, or a troubled time in your life. This fractured healing power is perhaps a reference to the Brecciated part of the stones name. It is thought to help with healing illnesses, and is thought to be a detoxifying stone that unites all areas of your life.